TCC has created an automotive technician training and ASE certification model, coupled with our LMS products, that is designed to increase your employee expertise and productivity, while reducing training seat time and overall training administration time. That translates into satisfied, loyal customers and a stronger, more profitable and competitive brand. Since 2001, TCC has served aftermarket, OEM, fleet and education organizations with proven, profit-generating training solutions. What makes using TCC’s automotive training content and our ASE certification model your best choice? TCC’s automotive training library, coupled with our LMS products, is designed to maximize the ASE certification attainment rate of your organization’s automotive technicians. Our custom end-to-end solution enables your organization to detect subject knowledge gaps, automate the assignment or required training specific to the gaps defined, practice ASE testing inside the LMS to sharpen skills, and finally sign up for an ASE test and capture ASE test results inside the LMS with little or no LMS administrative or manager intervention. This is a huge efficiency gain that pays big long-term dividends to your company. Validated, Timely, and Cost-Effective Offerings — TCC’s automotive training library has been put to the test by thousands of technicians, business owners, and managers to improve technician performance and deliver a rapid return on investment. TCC’s highly skilled automotive services professionals will customize a solution to meet your specific business needs. Whether it is new product training/selling, performance improvement, or leadership training – we can help you succeed. TCC delivers LMS and customized (and affordable) integration services that provide a single point of access to your employees or channel partners. We have provided LMS portal solutions to clients who have continually received national recognition and awards! 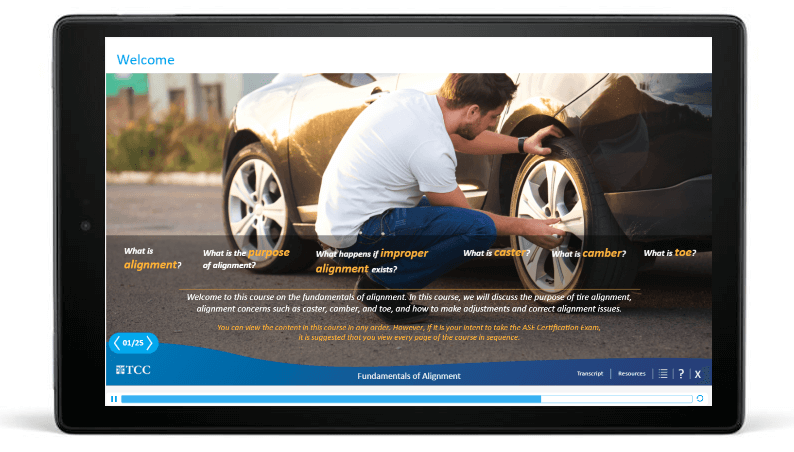 This Fundamentals of Alignment demo course is a 8-page snippet of the comprehensive TCC Auto Library. This course, like all others in our curriculum, provides best-in-class automotive technology training for ASE certification. This updated and comprehensive curriculum maps to all of the tasks prescribed in the 2019 ASE certification. The engaging use of rich media assures higher adoption, while the exploratory learning design enables leaners to explore each topic at a pace and order that best suits them. The purpose of the TCC Auto Library is to provide both best-in-class automotive technology training and an end-to-end ASE certification solution to help learners improve their ASE certification success rates. This updated and comprehensive curriculum maps to all the tasks prescribed in the 2019 ASE certification. The engaging use of rich media assures higher adoption, while the exploratory learning design enables leaners to explore each topic at a pace and order that best suits them. This is an abbreviated 8 page sample of our Fundamentals of Alignment course. Click the image to load the course and then click again to start the course. For additional information or to schedule a free online demonstration, call 317‑638‑0173 or submit through our contact form.